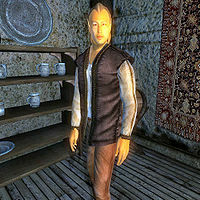 Gilgondorin is an Altmer publican who reluctantly runs Silverhome on the Water in Bravil. He sells food and shelter for the night and will, due to his extensive knowledge on local history and geography, help you (and Grantham Blakeley) during the quest The Forlorn Watchman. Gilgondorin and his next-door neighbor Nilawen have one thing in common. They both inherited their business from dead relatives and feel obliged to keep it going, despite having mixed feelings about Bravil; therefore, Gilgondorin swallows his artistic ambitions and spends all of his time maintaining the Silverhome. He can be found in the taproom on the ground floor day and night, offering his various services to customers and only taking a late two-hour dinner break at midnight. Gilgondorin will rent beds out at all times but will not barter with you while he is eating. He wears a simple set of middle-class attire consisting of a brown shirt with tan linens and a pair of doeskin shoes. He also carries a leveled amount of gold. When you approach him, he will politely introduce himself: "Gilgondorin. Silverhome-on-the-Water has beds and food. What's your pleasure?" When asked about Bravil, it becomes apparent that he might not be all that satisfied with his life: "Have you looked around? Bravil is Tamriel's cloaca. Silverhome is the only decent place in town. Don't know why I stay here." If you ask him for a room, he will make you an offer: "There's a room free, all right. Best you'll find in Bravil, if I do say so. 20 gold, and it's yours for the night." And he will finish off by pointing you towards your room: "Right! You'll have to go upstairs to the second floor. Your room is the second door on the right before the staircase. Thank you for your patronage." The townsfolk of Bravil have noticed the displeased innkeeper. In conversation, or when asked about rumors, they will say: "I don't think Gilgondorin really wants to run Silverhome-on-the-Water. He never seems happy when he's there. ", "I've heard he'd rather be a painter. Still, he runs the place well. ", "Gilgondrin [sic] inherited Silverhome from his parents. I understand he only runs it out of a sense of duty." and "He doesn't seem particularly happy. I think he'd rather spend his time painting." However, once you hear the rumors about a ghost wandering the shores of Niben Bay, the townsfolk will point you to the innkeeper due to his extensive knowledge on local legends: "If you're interested, you may want to see Gilgondorin at Silverhome-on-the-Water. When it comes to local legends, he's the best source in town." When asked about the ghost Gilgondorin will not disappoint you: "The Watchman looks like he may have been a sailor. No one knows where he came from, or why he looks so sad. I don't like talking about the dead like they're some kind of tourist attraction, but that spirit has been making his ghostly journey for years now. We've learned to just accept that he's there. Every night, sure as clockwork, he appears at Bawnwatch Camp at 8 on the shore of Niben Bay. He's never harmed anyone, but most people give him a wide berth. You seem curious enough, so I'll be glad to pinpoint where he appears on your map." After you have followed the ghost to Fort Irony, you will have the opportunity to ask Gilgondorin about the Mouth of the Panther: "Sure, I know what that is. Any sailor worth his weight in sea salt could tell you. The Mouth of the Panther is what they call the delta where the Panther River meets Niben Bay. It got its name from the pointed rocks that jut out of the water there... sort of look like teeth. Mouth, panther, teeth... get it? Ships are always careful to stay away from it, especially when its foggy on the Bay. The rocks would tear right through a ship's hull like parchment." When asked about The Forlorn Watchman at this point, he will simply say: "Never heard the name Grantham Blakeley before. Means nothing to me, sorry." If the quest Through A Nightmare, Darkly has not been started, Gilgondorin will reply to the Bravil dialogue topic by stating "My neighbor, Dro'shanji, is worried. He's seen creatures around the house lately. Why don't you talk to Dro'shanji, see if you can help?" but no further information about the creatures can be found. This seems to be the introduction to an Unfinished Quest that was cut from the final game.